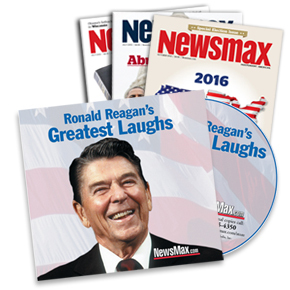 If you love Ronald Reagan — or just enjoy laughing — you need to get Newsmax.com's special audio program "Ronald Reagan's Greatest Laughs." Reagan often used humor to inform, and you'll share in his insights. No other President in modern times has used humor to capture the attention of the American people like Ronald Reagan did. During several decades of public service Ronald Reagan used his gift of humor as a tool and a weapon against his adversaries, unlike a lot of politicians who memorize stunt jokes to lighten up and entertain the crowd. Reagan had true wit and used humor in both public and private occasions. He was a funny man. Laughter was his way of creating a special warmth, like an electric arc between him and his audience. There's a lot we can learn from Reagan's humor. For those who believe that Ronald Reagan was an icon, this audio program will bring back great memories. For those of you who want to know what Reagan really believed, you'll find that out also. And for students of communication, you'll learn from the Great Communicator himself just how to use humor, make a point, deflect criticism, defang an enemy, win friends and elections, and influence people worldwide. So sit back, relax, laugh, and enjoy "Ronald Reagan's Greatest Laughs."